We’d love your help. Let us know what’s wrong with this preview of Body on Baker Street by Vicki Delany. To ask other readers questions about Body on Baker Street, please sign up. Can this book be read as a standalone or should I read the first 2 books? Vicki Sorry, I don't know how I missed this. Yes, you can read Body on Baker Street without having read Elementary She Read. One of my favorite features of the cozy mystery genre is the ability to weave together multiple themes and story-lines that carry over throughout each successive book in the series. In 'A Sherlock Holmes Bookshop Mystery' series by Vicki Delany we have just that and so much more. I have read a couple of the author's series and find myself on a kick to catch up on them all in the next few months so that by 2019, I'm ready for the latest releases. I just finished Body on Baker Street and give it 4 One of my favorite features of the cozy mystery genre is the ability to weave together multiple themes and story-lines that carry over throughout each successive book in the series. In 'A Sherlock Holmes Bookshop Mystery' series by Vicki Delany we have just that and so much more. I have read a couple of the author's series and find myself on a kick to catch up on them all in the next few months so that by 2019, I'm ready for the latest releases. I just finished Body on Baker Street and give it 4.5 stars for its clever plot, witty dialog, and memorable characters. Gemma and Jayne run a book shop and tea room with an ode to Sherlock Holmes. Gemma's got an on-again/off-again relationship with a local detective, but it also puts her in conflict with another detective who doesn't like Gemma very much because of her amateur sleuth activities. It makes for good conflict. In this caper, a famed author holds a signing at the store, but all is not as it seems. The author isn't truly the author, and her closely-kept staff have bigger connections than we initially realize. The books compromise some characters in the Sherlock Holmes canon which angers a few readers and fans, but it also ignites some passionate ones who love the changes. Which person took their emotions too far and killed the author with a lovely dose of poison? As characters, Gemma and Jayne are both likable and well-drawn. Jayne is the more reasonable one as Gemma thinks of things like breaking into a policewoman's desk to find clues. That's guts! The cat wandering the store makes for fun antics. The literary tones and references always make me smile. I enjoy the side stories and always look forward to the red herring clues. With at least 5 or 6 possible suspects, each has a true motive and were near the tainted water bottle. It makes for a solid mystery where it's less about alibis and more about who couldn't help themselves but commit murder. Vicki Delany, one of my favourite authors, has once again crafted an intricate tale that kept me hooked until its glamourous finale. The setting of the Sherlock Holmes themed bookstore connected to the English Tearoom next door is absolutly charming and the characters are well drawn. Renalta Van Markoff is my favourite - such a diva! My feelings about Gemma are mixed. On one hand she is reliable and caring in her friendships but on the other hand sometimes quite off-putting when talking to suspec Vicki Delany, one of my favourite authors, has once again crafted an intricate tale that kept me hooked until its glamourous finale. The setting of the Sherlock Holmes themed bookstore connected to the English Tearoom next door is absolutly charming and the characters are well drawn. Renalta Van Markoff is my favourite - such a diva! My feelings about Gemma are mixed. On one hand she is reliable and caring in her friendships but on the other hand sometimes quite off-putting when talking to suspects or the police. A very well written, enjoyable mystery with an abundance of information on Sherlock Holmes related books. I requested this book from NetGalley and am thankful that Crooked Lane Books and the author provided me with a copy. Along with her uncle, Arthur, Gemma Doyle is co-owner of the Sherlock Holmes Bookshop and Emporium. Their shop is connected to her friend Jayne’s Mrs. Hudson’s Tea Room. Gemma is thrilled when she’s asked to host a popular mystery author in her shop for a book signing event. It’s very short notice, but that’s not going to stop Gemma. This is a chance to make her bookstore a success and she’s not going to let it slip by. With help from Jayne, they quickly get both shops ready to accommodate the e Along with her uncle, Arthur, Gemma Doyle is co-owner of the Sherlock Holmes Bookshop and Emporium. Their shop is connected to her friend Jayne’s Mrs. Hudson’s Tea Room. Gemma is thrilled when she’s asked to host a popular mystery author in her shop for a book signing event. It’s very short notice, but that’s not going to stop Gemma. This is a chance to make her bookstore a success and she’s not going to let it slip by. With help from Jayne, they quickly get both shops ready to accommodate the event. Bestselling author Renalta Van Markoff has a huge following for her Hudson and Holmes mystery series. It doesn’t take long for word to get out about the book signing. The day of the event, Gemma finds herself with a packed house including all kinds of people - from obsessive fans to handsome book collectors. There’s also a devoted Sherlock fan who publicly attacks Renalta for ruining the Sherlock legacy. Plus, another person making wild accusations against Renalta. All of this leads to Renalta’s untimely death and possible murder. With quite a few suspects in the mix, Gemma fears the police are going in the wrong direction in their investigation. So, she lends a helping hand, whether they want it or not. This is the second book in the “A Sherlock Holmes Bookshop Mystery” series. I didn’t read the first one, but I don’t feel as if I missed anything. There is enough information in this book so readers don’t feel lost at all. The characters are strong, well-developed and intriguing. There is even a cute cat named Moriarity. This felt like a classic cozy murder mystery. The perfect setting in a Sherlock Holmes bookstore in a small town. Vicki Delany gets your attention from page one and doesn’t let you go. It’s a quick read and an enjoyable way to spend a few hours. I’ve read other series by this author and she certainly knows how to write clever cozy mystery series. She’s a proven expert at bringing mysteries to life. I'm already looking forward to book three and, yes, I'll be going back to read the first one. Gemma Doyle and Jayne Wilson are back and again find themselves in the middle of another murder investigation. This time an author, Renalta Van Markoff, comes to the Sherlock Holmes Bookshop and Emporium for a book signing and dies while signing a book. All eyes fall on the man, Donald Morris, that questioned her about her content during the Q & A Session. He is a huge fan of the original Sherlock Holmes and cannot abide by what she has done with the characters. Gemma knows he has strong beliefs about Holmes but she knows he wouldn’t kill anyone. She again teams up with her friend Jayne for a little sleuthing of their own. Gemma is a unique character, very independent, strong, and super observant. She notices things everyone else seems to miss and she has no trouble at all speaking her mind, not only giving her opinions but pointing out the facts as she sees them. She can be a little much at first but readers quickly realize how much like Sherlock Holmes she really is. Jayne is the perfect Watson to her Sherlock and together they make a wonderful team. The new cast for this story was very well fleshed out. The larger than life Renalta Van Markoff, her mousey personal assistant, Linda, and her protective publicist all come to life quickly in these pages. The bookshop the author has created for Gemma is fantastic and it is described in great detail making it very easy to imagine in my mind. I love that is has a tea room connected. It is the perfect place to pick up a book and venture next door to read while enjoying a pot of tea. The mystery was very well plotted and written but I had an alternate theory pop into my head almost immediately after the victim died and that theory was never realized in the story which surprised me. Instead, there was a clear set of suspects that emerged and there were several twists and turns before the actual killer was revealed. Once I let my theory go I narrowed down my suspects and figured out whodunit right before Gemma. But I was wrong about the motive 🙂 It was a fun mystery to read and follow along with Gemma. I will say Gemma is like a dog with a bone when she sets her mind on something. She puts herself into dicey situations because of that. I thought the best part of this one was seeing the interactions and affection between Gemma and her friends, like Jayne and Douglas. Gemma's character is one I really like, and I was glad to see her back in this second book in the series. In this installment, a popular author of a fictional series about Sherlock Holmes wants to do an almost last minute book signing at Gemma's store. The author comes for a pre-visit, and she is one nasty individual. The day of the book signing, a murder occurs, a I thought the best part of this one was seeing the interactions and affection between Gemma and her friends, like Jayne and Douglas. Gemma's character is one I really like, and I was glad to see her back in this second book in the series. In this installment, a popular author of a fictional series about Sherlock Holmes wants to do an almost last minute book signing at Gemma's store. The author comes for a pre-visit, and she is one nasty individual. The day of the book signing, a murder occurs, and Gemma is soon investigating so that one of her friends will not be falsely charged. I really enjoyed seeing the familiar characters from the first book, and enjoyed some of the new ones. There were also a few of those that readers love to hate! I thought this book moved along at a very nice pace, and the storyline held my attention from start to finish. It was a very enjoyable book, and I'll be looking forward to the next one! Gemma Doyle runs the Sherlock Holmes Bookshop and Emporium on Baker Street in West London, MA. Her best friend, Jayne, is next door at Mrs. Hudson's Tea Room. In this second book in the Sherlock Holmes Bookshop series, Gemma and Jayne are excited (and stressed) about the last minute visit of famous author Renalta Van Markoff to the shop. Markoff writes the Hudson and Holmes book series. The books are a bit controversial (and definitely non-canon) because Holmes and Mrs. Hudson are lovers, with M Gemma Doyle runs the Sherlock Holmes Bookshop and Emporium on Baker Street in West London, MA. Her best friend, Jayne, is next door at Mrs. Hudson's Tea Room. In this second book in the Sherlock Holmes Bookshop series, Gemma and Jayne are excited (and stressed) about the last minute visit of famous author Renalta Van Markoff to the shop. Markoff writes the Hudson and Holmes book series. The books are a bit controversial (and definitely non-canon) because Holmes and Mrs. Hudson are lovers, with Mrs. Hudson being the real genius instead of Sherlock. With only a day or so to prepare a huge signing event, Gemma and Jayne are stressed and worried that something will go wrong. And, of course it does. At the signing a local Sherlock fan who hates Markoff's books makes a huge scene, accusing her of disgracing the beloved classic characters. The author gives as much as she gets, and ends up winning the argument......but, then she promptly drops dead. After his huge public fight with the author, Donald Morris is immediately the number one suspect -- but he swears he didn't do it. Markoff was a difficult person. Gemma and Jayne have no limit on suspects who might have wanted her dead. Can they investigate and deduce the truth before Donald faces murder charges? I am a big Sherlock Holmes fan. So for me, this cozy series by Vicki Delany is just a joy to read. I love the facts and tidbits about Sherlock and Arthur Conan Doyle sprinkled throughout the books. I like Gemma as a main character, and all of the supporting characters are interesting, quirky and delightful. I catch myself wishing the bookshop and tea room were real. I would SO love to have lunch there and browse the shop after! :) The books are a nice mix of mystery and background theme. And there are always enough suspects to keep the reader guessing til the end. Lots of humor, too! I will definitely be reading more of this series! Another excellent installment in this series. An "over-the-top" author with a somewhat controversial "take" on a more modern Sherlock Holmes decides to come to Gemma's bookshop in West London for an impromptu book signing with her meek publicist and bodyguard. But she doesn't leave alive and as the layers unravel, more suspects appear. I like the series but Gemma is a bit too much of a "know-it-all" for me. I just think her character goes too far and is unlikeable for me. One of my favorite things about this series is that it doesn’t take itself too seriously. There is a lot of subtle humor going on – Moriarty the cat, Gemma’s quirks, her employee’s ever-changing style, the Benedict Cumberbatch lifesize cutout. All while honoring the Great Detective (in all his forms) at the same time. Subtle wit, great characters, well-plotted mystery and nods galore to everyone’s favorite Baker Street detective – these are the qualities that make Body on Baker Street a must read One of my favorite things about this series is that it doesn’t take itself too seriously. There is a lot of subtle humor going on – Moriarty the cat, Gemma’s quirks, her employee’s ever-changing style, the Benedict Cumberbatch lifesize cutout. All while honoring the Great Detective (in all his forms) at the same time. Subtle wit, great characters, well-plotted mystery and nods galore to everyone’s favorite Baker Street detective – these are the qualities that make Body on Baker Street a must read. Gemma is relatable, even in her social awkwardness, and the book store is stocked with items and books that will have bookworms twitching for a visit. Even though this is the second book in the series, it can easily be read as a standalone. I enjoyed this a lot more than the first book. Gemma was still obnoxious, but she seemed a little more aware of her attitude this time, and Jane was quick to scold her. The mystery was great, with some awesome twists. The reveal was surprising and very fitting for a Holmes inspired series. Now I'm all caught up and ready for whenever the fourth book comes out! This one was really good and especially interesting since it had to do with an author being killed in Gemma's store. Gemma had set up a last minute book signing at her store for a flamboyant but well-loved author. The woman wasn't so well-loved in the die-hard Sherlock community though because Donald Morris, local Sherlock expert and fancier of all things Sherlock had angry words with her just before she face planted into the Now I'm all caught up and ready for whenever the fourth book comes out! This one was really good and especially interesting since it had to do with an author being killed in Gemma's store. Gemma had set up a last minute book signing at her store for a flamboyant but well-loved author. The woman wasn't so well-loved in the die-hard Sherlock community though because Donald Morris, local Sherlock expert and fancier of all things Sherlock had angry words with her just before she face planted into the book she was signing. Poor Donald ended up arrested eventually and begged Gemma to look into this case for him. Since Gemma had higher-than-normal type senses and instincts, she agreed to see what she could do, all the while dodging snarky detective Louise Estrada and hoping for a little attention from her former boyfriend, detective Ryan Ashburton. Add to that, just trying to stay alive since the killer seemed to be getting worried at one point. There were plenty of suspects but narrowed down probably just the normal amount, as well as twists and turns that had me doubting my first choice. It didn't surprise me when I found out who it was but I hadn't guessed the reasoning. The showdown was great and everything ended up working out for everyone involved, well except for the killer. It was fun to see Jayne's mom in the story since this is the first time she was featured. She seems really nice and your typical nurturing mom. I'm hoping that Gemma and Louise Estrada start getting along better. It seems like if each one of them would just give a little, it would work better. Gemma is so intelligent she just can't help the comments she makes sometimes which is what usually makes Louise mad at her. I hope Gemma and Ryan can work things out and be together and it would be great to see Jayne eventually with someone other than Robbie (preferably Andy that likes her) Oh well these are just the fun side things. It's always a great mystery at the Sherlock Bookshop! The second book in the Sherlock Holmes Bookshop mystery. I found a spellbinding book with characters developed in depth. The location description will place you in a bookstore and tearoom. The actions of Moriarty are right on. Gemma Doyle is amazed to receive a request to hold a book signing in two days for a best-selling author. She rushed to get enough books into the store and released the news. At the signing, the author is poisoned and Gemma is warned to stay out of the investigation, she sta The second book in the Sherlock Holmes Bookshop mystery. I found a spellbinding book with characters developed in depth. The location description will place you in a bookstore and tearoom. The actions of Moriarty are right on. Gemma Doyle is amazed to receive a request to hold a book signing in two days for a best-selling author. She rushed to get enough books into the store and released the news. At the signing, the author is poisoned and Gemma is warned to stay out of the investigation, she starts looking into the affair. The tale will fasten your attention until the end stuns you. I highly recommend this book. Gemma Doyle returns for another adventure in Vicki Delaney's Body on Baker Street. The proprietor and half owner of The Sherlock Holmes Book Shop and Emporium, Gemma is delighted to receive a request to come do a book signing of her latest book from the best selling Renalta van Markoff. The author writes a bodice ripping series in which Sherlock Holmes and Mrs. Hudson are lovers, with the woman's being the real brain behind the detective. The excitement over Renalta's coming appearance rises, es Gemma Doyle returns for another adventure in Vicki Delaney's Body on Baker Street. The proprietor and half owner of The Sherlock Holmes Book Shop and Emporium, Gemma is delighted to receive a request to come do a book signing of her latest book from the best selling Renalta van Markoff. The author writes a bodice ripping series in which Sherlock Holmes and Mrs. Hudson are lovers, with the woman's being the real brain behind the detective. The excitement over Renalta's coming appearance rises, especially when Renalta shows up the Thursday before her Saturday book signing and charms all her fans, though Gemma sees another side of the author as self-centered and petulant. Full Disclosure: I received a copy of this book from the author through the Cozy Mystery Review Crew in exchange for an honest review. Fuller Disclosure: I am an unabashed Sherlock Holmes nerd and have been since high school. My expository speech in high school speech competition was all about the Great Detective, my parents bought me a deerstalker cap for Christmas….well, you get the idea. So of course when I first learned about the Sherlock Homes Bookshop and Emporium series, I was jumping up a Full Disclosure: I received a copy of this book from the author through the Cozy Mystery Review Crew in exchange for an honest review. Fuller Disclosure: I am an unabashed Sherlock Holmes nerd and have been since high school. My expository speech in high school speech competition was all about the Great Detective, my parents bought me a deerstalker cap for Christmas….well, you get the idea. So of course when I first learned about the Sherlock Homes Bookshop and Emporium series, I was jumping up and down in anticipation. The series, and particularly this book, does not disappoint. Gemma Doyle is the proprietress of the Sherlock Holmes Bookshop and Emporium, (she co owns the shop with her great Uncle Arthur), and is part owner of the business next door, Mrs. Hudson’s Tea Room, with her best friend, Jayne Wilson. The shop is located in West London, Massachusetts. In this second book in the series, Gemma is surprised by a last minute request to host a popular author, Renalta Van Markoff, at her shop. Renalta writes a “Holmes and Hudson” series that are controversial among many Sherlock Holmes fans. Right after Renalta is questioned by Donald Morris, a regular customer of Gemma’s, the author collapses and dies. When Donald is subsequently charged with the murder, Gemma is drawn into the investigation. There are a lot of things to like about this installment in the series. Gemma is an extremely appealing protagonist; she shares Holmes’ powers of observation and is also a strong, intelligent independent woman. The supporting characters, particularly Jayne and the-as-yet-unseen Uncle Arthur are interesting in their own right. And finally, Vicki Delaney sneaks in references to Sherlock Holmes stories (for us Holmes nerds). I love this series! Gemma is so observant and therefore a great one to be on your team to solve a crime. Gemma knows Donald did not commit the murder but works to find out who did so Donald can be cleared. The story flows quite smoothly and kept my interest up. I loved the reference to The Poisoned Pen Bookstore in Scottsdale, I have been there a time or two. I really was confused by some of Gemma's conclusions in one area but it came out in the end, why she thought that way. Gemma is still on De I love this series! Gemma is so observant and therefore a great one to be on your team to solve a crime. Gemma knows Donald did not commit the murder but works to find out who did so Donald can be cleared. Gemma is still on Detective Estrada's bad side but maybe there will be some break through coming. Moriarty still has some explaining to do. Gemma Doyle is having a regular day at the Sherlock Holmes Bookstore and Emporium in West London when she gets a phone call that throws off her day--can she host a book signing for an author, in two days time? Gemma is about to refuse until she learns the author is Renalta Van Markoff, who writes the famous Hudson and Holmes books, a take on the Sherlock Holmes books that feature a romantic relationship between the famous detective and his landlord, Mrs. Hudson. The author has a loyal following, a Gemma Doyle is having a regular day at the Sherlock Holmes Bookstore and Emporium in West London when she gets a phone call that throws off her day--can she host a book signing for an author, in two days time? The author has a loyal following, and Gemma agrees to the signing. But not everyone is taken with the famous author. When West London resident and Sherlockian Donald Morris, tells Van Markoff she must stop besmirching the name of Sherlock Holmes, and she drops dead, the cops point the finger at him first. Donald asks Gemma to help prove his innocence and she enlists the help of her Watson, Mrs. Hudson's Tea Room owner Jayne Wilson, to do just that. Body on Baker Street is a great sophomore effort in the Sherlock Holmes Bookshop Mystery series. Gemma is a perfect protagonist for this series. Like Sherlock, she notices things people don't normally see. Sometimes that ability sets people on edge, but Gemma continues to work the puzzle until she comes up with the right solution. The puzzle in this mystery is intriguing, and I love the characters Vicki Delany created to tell her tale. Even those you are supposed to dislike, for instance the detective who doesn't like Gemma poking her nose into the case, adds to the flavor of the book. There are plenty of clues, but I still found myself changing my mind as to whodunit as the book progressed. I loved the first book in this series, and the second one pins this series as one of my new favorites. I eagerly await the next book in this series. I've been looking for a cozy book that I could sink my teeth into but I don't think this series is going to make it. I enjoy Gemma and her best friend Jayne, but Gemma was a bit too crazy in this book with her wanting to break into the police headquarters. I really disliked the police woman, Detective Estrada from book #1 but for some reason she really got on my nerves in book #2. Her snide remarks and mannerisms were too much. Enough is enough so this series is a goner for me now. I enjoyed the second book in this series even more than the first. I am still a bit perplexed that Gemma's personality doesn't bug me, but for whatever reason, I find her lack of social skills somehow endearing rather than irritating. Also, I feel like Gemma has settled down a little, AND she seems to at least recognize how some of her behaviour comes across to other people, which somehow makes it less annoying. It is also only fair to acknowledge that while Gemma may irk people, she usually is th I enjoyed the second book in this series even more than the first. It is also only fair to acknowledge that while Gemma may irk people, she usually is the person who gets things others don't, so while she may annoy people with her comments and insights, they are usually right, so you can only be *so* annoyed with her. The supporting characters in this mystery were fun and the murder and the investigation I found very interesting and it kept me reading right to the end to find out who did it [which I did not figure out]. I am enjoying this series a lot, and look forward to future books! Body on Baker Street by Vicki Delany is the second book in the Sherlock Holmes Bookshop Mystery series. The Sherlock Holmes Bookshop and Emporium hosts an appearance and book signing by the author of the controversial Hudson and Holmes mystery series, only to have her drop dead of cyanide poisoning during her appearance. I enjoyed this book very much and loved all the Sherlock Holmes references. Gemma Doyle makes an excellent female version of the great detective. This 2nd book in the Sherlock Holmes Bookshop Mystery was just as entertaining and enjoyable as the 1st! So many suspects, red herrings, and fun Sherlock Holmes facts, you won't want the story to end! I voluntarily reviewed this book via NetGalley. The game is afoot! Originally part of a quote from a play be Shakespeare, these words have a positive, if at times gleeful, meaning to followers of Sherlock Holmes. It also has meaning to some of Gemma’s customers at the Sherlock Holmes Bookshop and Emporium. Vicki Delany packs a punch in another delightfully intellectual, logical mystery that doesn’t fail to baffle armchair Sherlocks, demonstrating her talent for combining mystery, humor, and suspense while celebrating the friendships of women. The game is afoot! Originally part of a quote from a play be Shakespeare, these words have a positive, if at times gleeful, meaning to followers of Sherlock Holmes. It also has meaning to some of Gemma’s customers at the Sherlock Holmes Bookshop and Emporium. Vicki Delany packs a punch in another delightfully intellectual, logical mystery that doesn’t fail to baffle armchair Sherlocks, demonstrating her talent for combining mystery, humor, and suspense while celebrating the friendships of women. Gemma was startled to be asked if Renalta Van Markoff, a best-selling author, could have a book signing at her shop with a scant two-day notice. Renalta writes novels about Sherlock Holmes and his landlady, Mrs. Hudson in a light that Doyle certainly did not ever intend. Women loved them. True Sherlockians did not, and wanted the series ended. Including Donald, the local Holmes scholar, who threatened to get Renalta to end the series. Renalta and her entourage of her personal assistant, Linda, and her publicist Kevin, arrived at the appointed time. Many, many books awaited her autograph and there was standing room only in the bookshop and the adjacent Mrs. Hudson’s Tea Room. Renalta finished her speech, and Donald made what sounded to many to be a threat. Renalta opened her third bottle of a specially-requested bottle of water, took a huge swig – and collapsed. Within a short time, she was dead. Donald’s threat came back to haunt him quickly. Gemma, who had unsealed the special bottles of water before the signing for Renalta, had a possible opportunity, also. The unsealed bottles had been left untended several minutes before Renalta’s talk began. Donald asks Gemma to please clear his name, so Gemma is on the trail of another killer. I like the assorted characters in this series! Gemma is secretly a romantic, but her intelligence most often shows her as pragmatic and a bit too straightforward and tactless. The eclectic group of people who are closely in Gemma’s life share various things: Jayne, best friend and romantic, gives her mothering when needed and sometimes is Ethel to Gemma’s Lucy, Grant shares friendship and as a fellow bookseller and would-be suitor, Ryan…continues to give mixed signals. Moriarty, the shop cat, adores almost everyone except Gemma, so going home to sweet pawsonality pup, Violet, is a wonderful treat. The people specific to this mystery, Renalta, Linda, Kevin, Robert, Paige, and Nancy, bring their own dimension of eccentric to the mix. This is a very well-written, challenging mystery. Each plot twist provides a change to the number of suspects – either adding or eliminating them. The clues are masterfully placed to continually challenge Gemma and the reader. While I sometimes shake my head at Gemma’s determination to follow the clues in spite of the risks, I do admire her loyalty to her friends and desire for justice to be done. I did figure out who the culprit is, but didn’t have the right motive so there were still surprises. A couple plot twists almost changed my mind as the new clues presented were so compelling! What a great mystery! I highly recommend Vicki Delany’s newest offering in her Sherlock Holmes Mystery series. Well worth the read! While I’ve read and loved Vicki Delany’s delightful Year-Round Christmas mysteries, I was not familiar with the Sherlock Holmes Bookshop series. However, now that I’ve read “Body on Baker Street,” I will definitely go back and read the first book, “Elementary, She Read." It would be tempting, from the book jacket description, to think the premise a bit cute: a Holmes-focused bookstore located at 222 Baker Street in a town called New London. But the book is so well written (especially the dialogue While I’ve read and loved Vicki Delany’s delightful Year-Round Christmas mysteries, I was not familiar with the Sherlock Holmes Bookshop series. However, now that I’ve read “Body on Baker Street,” I will definitely go back and read the first book, “Elementary, She Read." It would be tempting, from the book jacket description, to think the premise a bit cute: a Holmes-focused bookstore located at 222 Baker Street in a town called New London. But the book is so well written (especially the dialogue; nothing spoils a cozy for me faster than clumsy dialogue!) and the characters and setting so charming, I bought into it immediately once I started reading. The author quickly sets up the crime: the suspicious death of an imperious author who writes (or does she?) a highly popular series of Holmes-ian mysteries. There is no shortage of suspects, and a number of red herrings kept me guessing each time I thought I knew the identity of the perpetrator. I enjoyed the book a great deal. Gemma Doyle, the owner of the Sherlock Holmes Bookshop and Emporium, has a Monk-like ability to quickly and accurately assess details – for example, the number of books in a display or where customers were standing in her store. She is highly analytical and always certain about things, and this, combined with her dry British sense of humor, makes her quite entertaining. She and her American business partner Jayne, who runs the adjoining tearoom, play off each other well because their personalities are so different. And I loved Moriarty, the bookstore’s resident black cat who likes everyone except Gemma! 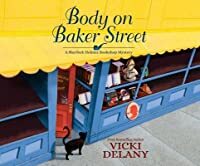 Body on Baker Street by author Vicki Delany is the second book in the Sherlock Holmes Bookshop Mystery Series. I am enjoying this series and recommend you read the first one to get the back story on these wonderful characters. Gemma Doyle and her Uncle Arthur Doyle own the Sherlock Holmes Bookshop in West London, Massachusetts. Uncle Arthur is travelling as usual, and Gemma is running the bookshop and emporium, as well as assisting in the operation of the adjoining Mrs. Hudson's Tea Room, which Body on Baker Street by author Vicki Delany is the second book in the Sherlock Holmes Bookshop Mystery Series. I am enjoying this series and recommend you read the first one to get the back story on these wonderful characters. Gemma Doyle and her Uncle Arthur Doyle own the Sherlock Holmes Bookshop in West London, Massachusetts. Uncle Arthur is travelling as usual, and Gemma is running the bookshop and emporium, as well as assisting in the operation of the adjoining Mrs. Hudson's Tea Room, which they co-own with Gemma's best friend, Jayne. Gemma gets a call from Linda, the assistant to bestselling author Renalta Van Markoff, asking to set up a book signing that weekend. Gemma agrees and quickly set it all up. When Renalta is murdered during her book signing at the shop, and West London resident Donald is arrested, Gemma agrees to help Donald clear his name. There are a lot of suspects, including family members, and Gemma is quite astute in getting information. Having an amazing power of observation and ability to interpret clues she is soon deep into the investigation. 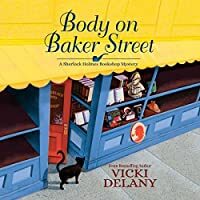 Vicki Delany follows up the first fun Sherlock Holmes Bookshop Mystery, Elementary, She Read, with the equally delightful Body on Baker Street. Gemma Doyle is becoming one of my favorite amateur sleuths, although I don't think I'd want to live with her. As owner/manager of the Sherlock Holmes Bookshop and Emporium on Baker Street in West London, Massachusetts, Gemma is a smart enough businesswoman to agree with author Renalta Van Markoff wants to appear at the bookshop. 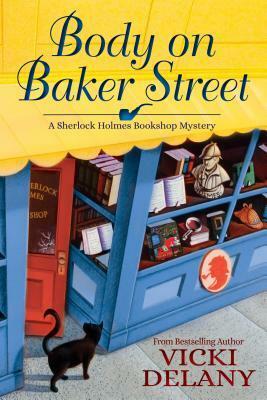 Renalta may be a little ov Vicki Delany follows up the first fun Sherlock Holmes Bookshop Mystery, Elementary, She Read, with the equally delightful Body on Baker Street. Gemma Doyle is becoming one of my favorite amateur sleuths, although I don't think I'd want to live with her. As owner/manager of the Sherlock Holmes Bookshop and Emporium on Baker Street in West London, Massachusetts, Gemma is a smart enough businesswoman to agree with author Renalta Van Markoff wants to appear at the bookshop. Renalta may be a little over-the-top and demanding, but her controversial Holmes and Watson books are bestsellers. When the day of the book signing arrives, over a hundred show up at the bookstore. The majority are excited to hear Renalta in person, but after she slaps down a confrontational customer, she keels over dead. With the police already in attendance for crowd control, it only takes minutes for Gemma to suggest that Renalta was murdered. While one police officer is always suspicious of Gemma's methods, the detective she once dated knows she has an uncanny grasp of mysteries. While Gemma lacks social skills, she has a Sherlockian ability to analyze situations and find the truth. While she sidesteps around the police, she questions Renalta's entourage and several wacky characters who pursued the author. Even when she's in danger herself, Gemma is determined to find the truth. Gemma Doyle. She's probably an exasperating person to deal with, but she's as perceptive as Holmes himself, and she lacks the same ability to understand people. It's her friends and dog who make her human, while her antagonistic relationship with Moriarty, the bookshop cat, adds humor. Body on Baker Street is the second book in the Sherlock Holmes Bookshop Mystery series, and it definitely lived up to my expectations. Gemma Doyle and her partner-in-solving-crimes Jayne Doyle are tasked with clearing their friend’s name when he is accused of murdering a famous author. The now-deceased author wrote books based on the concept that Sherlock Holmes and Mrs. Hudson were actually lovers, and true Sherlockian that he is, Donald Morris berates her publicly for the scandalous and ridicu Body on Baker Street is the second book in the Sherlock Holmes Bookshop Mystery series, and it definitely lived up to my expectations. Gemma Doyle and her partner-in-solving-crimes Jayne Doyle are tasked with clearing their friend’s name when he is accused of murdering a famous author. The now-deceased author wrote books based on the concept that Sherlock Holmes and Mrs. Hudson were actually lovers, and true Sherlockian that he is, Donald Morris berates her publicly for the scandalous and ridiculous theory. I loved the concept of an author (in the book) putting the “real” Sherlock Holmes and Mrs. Hudson in Romantic Suspense books. I found it very creative of author Vicki Delany to come up with the idea for this novel. The victim is an over-the-top drama queen author, but thanks to Gemma’s keen observational eye, she sees the cracks in her persona, and realizes there’s more going on that what appears. There are several twists, turns, and surprises that I don’t want to give away, but for Cozy Mystery lovers who like well-constructed mysteries, this is definitely a must-read. The characters are well-crafted, fully-formed, and perfect for this series. Ms. Delany added some great red-herrings, so I never saw several things coming, and it was a great ending. It’s a very interesting plot that takes the reader on a fun ride. I’m very much looking forward to more in this series! The follow up to "Elementary She Read" was funny, entertaining, and the murderer was a shocker! Gemma is busy running her bookshop, "The Sherlock Holmes Bookshop and Emporium" when she gets a call for an author signing. The signing is for a very famous author, Renalta Van Markoff, and the booking is very last minute. Gemma makes the signing happen and during the event, the author is killed. The murder was set up in such a way that ANYONE who was present during the book signing could have been the The follow up to "Elementary She Read" was funny, entertaining, and the murderer was a shocker! Gemma is busy running her bookshop, "The Sherlock Holmes Bookshop and Emporium" when she gets a call for an author signing. The signing is for a very famous author, Renalta Van Markoff, and the booking is very last minute. Gemma makes the signing happen and during the event, the author is killed. The murder was set up in such a way that ANYONE who was present during the book signing could have been the murderer; now it's up to Gemma to solve the case. Of course, the local PD, including Ryan Ashburton and Louise Estrada, do not want her help in solving the crime, but Gemma gets involved anyway. I can't wait to read book #3 in this series! “It’s a crime not to read Delany,” so says the London Free Press. Vicki Delany is one of Canada’s most varied and prolific crime writers. She is the author of the Sherlock Holmes Bookshop series from Crooked Lane and the Year Round Christmas series from Penguin. Under the pen name of Eva Gates she writes the Lighthouse Library Series. Visit Vicki at www.vickidelany.com , www.facebook.com/evagatesa “It’s a crime not to read Delany,” so says the London Free Press.